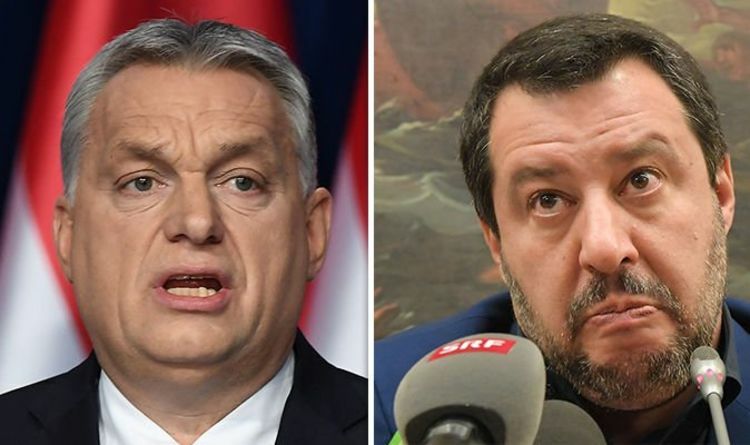 The European Council on Foreign Relations (ECFR) think tank says the elections represent a “make or break” moment for the bloc with far-right, anti-establishment parties such as Lega Nord in Italy and Hungarian Prime Minister Viktor Orban’s Fidesz likely to take a third of the seats up for grabs. ECFR warns many parties are planning to “destroy the European project from within”, and could also vote down any future UK-EU trade deal after Brexit. The report, written by Susi Dennison and Pawel Zerka, warned: “Unfortunately for beleaguered internationalist Europeans, the election really does matter. “The vote could see a group of nationalist anti-European political parties that advocate a return to a ‘Europe of the nations’ win a controlling share of seats in the EP. “Among them number many figures who are strongly sceptical of free trade, in favour of pulling the drawbridge up against migration, and supportive of Moscow’s arguments about the need to flout international law in the Russian national interest in Ukraine. The report suggested if populist parties did manage to “cross the one-third threshold”, it would signify a “a qualitative change” in the EU. It added: “ECFR’s calculations in this paper assume that the UK will not participate in the May 2019 election. Europe’s right and far right could even formally establish a new political group, which would be the second-largest political family in the EP, it said. The report said: “As it stands, neither Orban nor the EPP have an interest in announcing a divorce before May 2019. A recent poll of polls suggests Lega and Five Star Movement in Italy, Germany’s far-right AfD and Fidesz were all likely to be substantial beneficiaries. Jude Kirton-Darling, Labour MEP for the North East, told Huffington Post the report “clearly and systematically addresses how the far right, in particular, is hoping to wreak havoc in the EU”.